Lots of updates this month! Click on March, on the left-hand side of this page, to grab them all in one go. 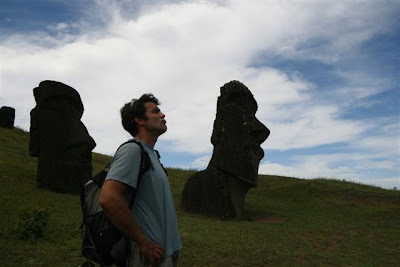 Rapa Nui, Easter Island, or Isla de Pascua is just south of the Tropic of Capricorn, and about 3790km from Chile, making it one of the most geographically isolated places on earth. It's nearest neighbour is Pitcairn Island. I enjoy a good view of how small it is from seat 2L as our plane descends into Mataveri Airport. To give you an idea, it's effectively a triangle, with volcanoes Poike, Rano Kau and Terevaka in each corner, and to walk any one side is approximately a six hour hike. The weather is generally tropical, with lots of sun, and frequent short showers, giving the island a balmy green appearance, with banana trees and their big leaves, other fruits, plants and grass flourishing. Off the plane, and it's 24C apparently, and slightly cloudy, though stepping out it feels hotter, and is very humid. My original plan was to walk around to find a hostel, but in the heat and based on Gonzales' honest face I cop out and take Kona Tau hostel [GPS: 27.15487S, 109.42931W] at their airport desk for slightly less than the hostelworld.com price. I watch everyone getting their garlands as they arrive, then we are taken to the hostel on Avarepui street by car, though it's no more than a 10 minute walk. Also coming along is an Israeli woman and Carlos, a chap from Spain. Bags in room then then wander out with Carlos and an Austrian chap to explore Hanga Roa, the main (okay only) town on the island. There are a smattering of shops, restaurants and bars along the main street, Atamu Takena. There are plenty of supermarkets, though only one source market which is the best place to buy things - Kai Kene. The tourist tat consists mostly of mini wooden Moai etc, priced like most of the island - prohibitively! 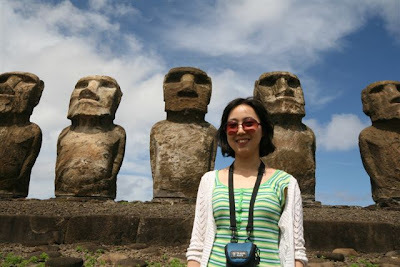 So, Moai are the large stone statues that make the island famous, and there are over 900 of them here (some postcards say 600). All face inland except the seven at Ahu Akivi which gaze out to sea. Ahu means an altar, and there are 270 of these. 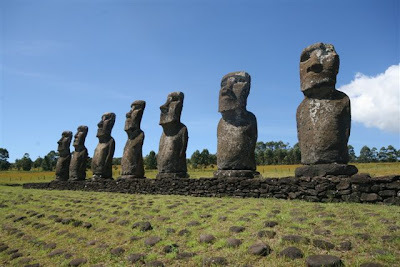 It is worth bearing in mind that many of the Moai are fallen, usually facing down, so every pile of rocks around the coast is potentially a Moai or Ahu. The standing ones are somewhat more interesting! According to folklore here, Ariki (King) Hotu Matu'a, his family and court arrived on a beach called Anakena (now the main beach on the island) in two big canoes. He settled down in his new home and called the island "Te Pito o te Henua" which means Navel of the World. 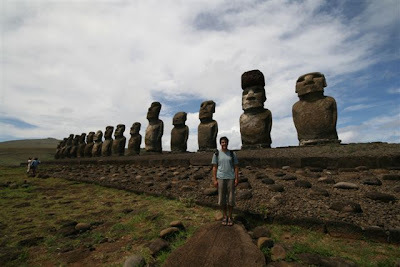 Easter Island was so named because Dutch explorer Jacob Roggeveen arrived here in 1722 on this day. After seeing the whole town in an hour or two, including noting that the only bank here is the evil Banco Estado, so no ready access to cash, we bought postcards then headed back to the hostel for a siesta, well needed in my case after sleeping in Santiago airport the night before! 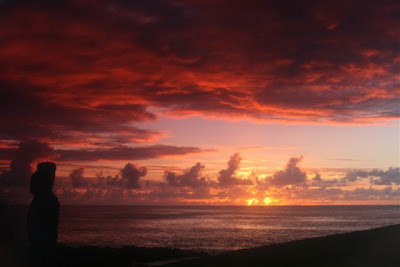 Up to see sunset at Ahu Tahai, just the other side of town. 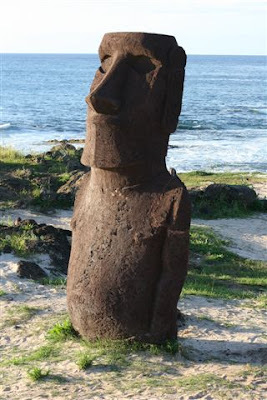 This has a few interesting Moai Ahu Ko te Riku, which has eyes, made from white coral and obsidian. 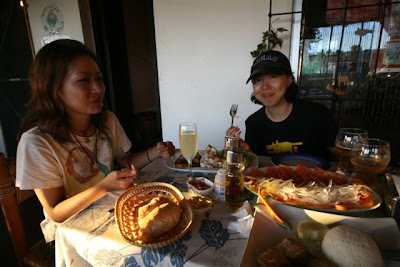 As the sun sets, we meet a couple of girls who were on our plane earlier - Garam and Mariko, and head together to the Aloha pub near our hostels for ceviche (raw fish marinaded in lemon juice) and carpaccio, washed down by a couple of escudo beers (the cheapest, Escudo, at £1.50 for a small can), and pisco sours for the girls. Next a few doors along to another bar for live music, tropical island beats with ukuleles. We plan to wake up early next day, hire scooters and circle the island. Is it a bomb or a lighthouse? and passing by the (and I quote) "hundreds of archeological traces" scattered along the coastline with hardly a thought (the significant word is "trace"!!) 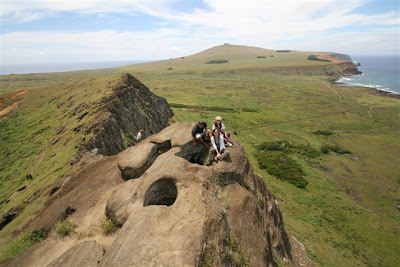 before we reach the crater of Rano Raraku volcano [GPS: 27.12469S, 109.28679W] and the 15 Moai close by at Ahu Tongariki. 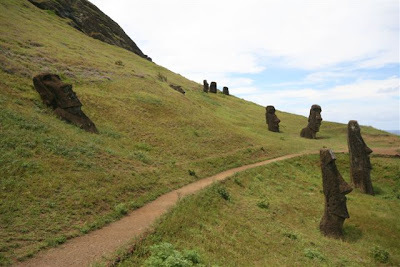 This crater is the only stone quarry here, in use since 900AD, and is where all the Moai were cut and shaped before being positioned all around the island. The fascinating thing about the place now is that there are Moais mid-construction - some just cut rock, others fashioned into the rock face with all their features but not yet moved, and others complete, but just in front of the quarry waiting to be shifted. 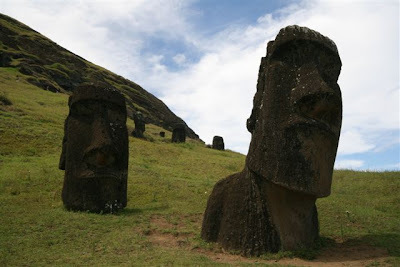 One of the classic shots of the island here is of the large faces sitting on the hillside, gazing in different directions. 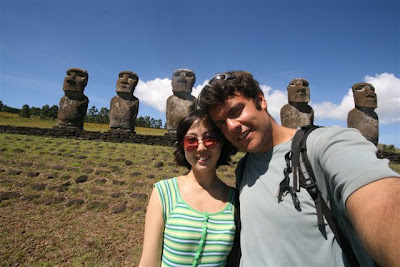 The largest Moai lies on the ground here, enormous at over 20m long. I'm not sure how heavy it is, but the largest Moai moved out of the quarry at Atu te Pito Kura is 11m long and weighs 80 tonnes, so I'm guessing 20+m would be about twice as heavy. 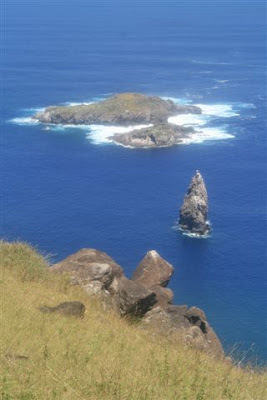 We climb to the top of the crater for a marvellous view over the island, including down to Tongariki where we head next. 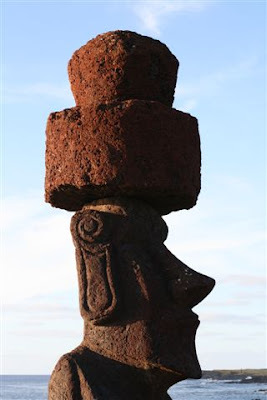 This is the site on all the postcards - 15 Moai of various shapes and heights standing in a line facing Rano Raraku with the ocean behind. It's magnificient. The site was destroyed by a tsunami in 1960, but a Japanese restoration team rebuilt the site in the 90s. We resolve to return here the next morning to watch sunrise. Next we cut across to Anakena beach on the north side of the island - the road turns into a dirt track but is still okay. Anakana Beach [GPS: 27.07292S, 109.32357W] is an amazing spot. 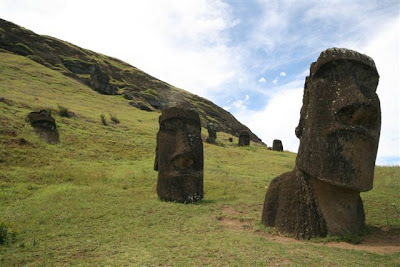 We park up and walk through the palm tree grove with sand underfoot, past Ahu Nau Nau altar, with some of the best-preserved Moai of the whole island, as they were hidden under the sand for many years. Four of them have pukao, or the hats made from red volcanic rock, each one different. By now we are hot and tired, so it is wonderful to slip into the warm turquoise Pacific waters and swim about in the bay. 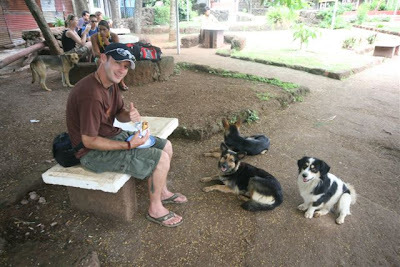 We have a picnic in the palm tree grove, then head back to town the fast route, over the best (tarmac'd!!) road on the island, with a 60km/hr speed limit. There is a big cruise ship moored off the island now, but strangely it doesn't seem to boost the numbers of people about. All of the sites are suprisingly and pleasantly quiet at all times of the day. The girls are tired and retire, so Carlos and I head to use the internet then head to a Polynesian dance show called Matato'a that the internet guys recommend.. The show was in a restaurant near the bank, and consists of two lines of chairs facing a small stage, with the band behind. There are three ladies and four men dancing, then the band consists of about 8 people. The dancers are dressed in traditional clothing, and act out and sing traditional stories. The music is really good - I would pay just to hear the band play even without the dance, but overall with the energetic and happy dancing plus the happy island music, it is a really good experience. I wanted to buy the CD, but it was $20! …then the girls wake us for sunrise! 6:15am! In a daze, we drive across the island, insects slapping into my face as I can't wear my sunglasses in the dark, to Tongariki, and the 15 Moai. We arrive just in time as the sky lightens, then wait until the sun is up and clears the low clouds on the horizon. There are just half a dozen people there, and the experiences is magical as the sky lights up behind the silhoutted Moais. Back to town, and I extend my stay here, cutting short Tahiti, as I've heard lots of bad things about the place (mostly about the cost, but also the lack of anything to do except lounge about in large touristy hotels), and we keep bikes for another 24hrs. 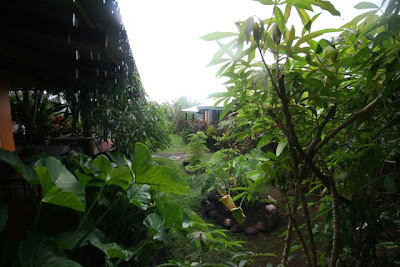 We head up to Orongo, the birdman village and the crater of Rano Kau. 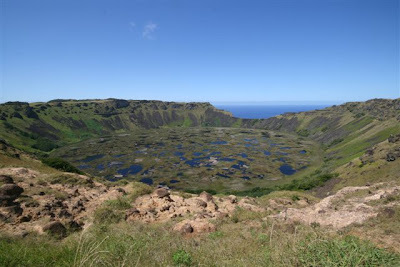 This is the largest crater on the island, at 1km across and 280m deep. There are steep cliffs lining the rim, dropping down to the crater lake, and the rim drops in height on the side meeting the ocean. It's beautiful. 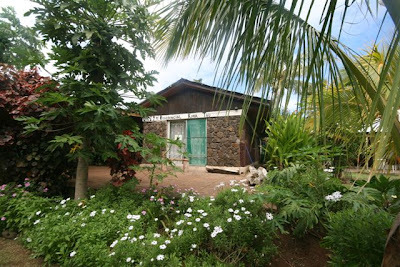 Orongo is a small former settlement, with old stone houses now empty and with little in the way of explanations. The Conaf guardaparques guard the entrance, and consider themselves to be really funny guys. This is one of the places where they collect a $10US fee for visiting the "park", i.e. the whole island, as usual to fund Conaf slackers, their dvd players and comfy sofas. As an Australian chap living here pointed out, they should just collect the fee at the airport as a departure tax and be done with it. Anyway, what is the birdman stuff all about. 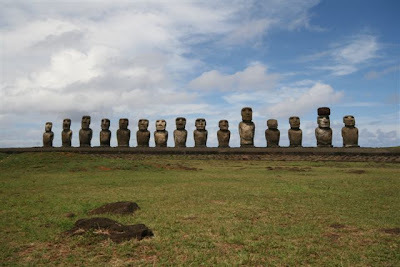 I must confess I'm a bit ignorant here, apparently I have to watch the "Rapa Nui" film, a hollywood blockbuster type thing with a romance etc, but does explain all the legends. From what I can gather, there were various tribes living on the island. Once a year, the best guys from each tribe would compete to become the chief of all tribes, the birdman, by swimming out to the island below - Moto Kau Kau, Iti and Nui, finding an egg of the Manutara bird, and bringing it back in tact. This is no mean feat when you see the large swell around these rocky islets and the waves crashing back and forth. In to town, we write some postcards, the girls cook pasta, Carlos and I cook pringles, then we head out on the coastal road north. What a terrible terrible road! We are riding bikes that are designed for nipping about town, not careering all over the place over boulders! 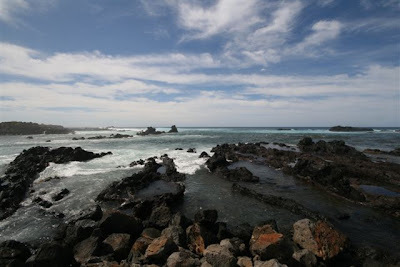 We turn back, and head to Merahi Ra'a for grilled fish, ceviche and beers. Back at ours, we have a small party with Garam's Chilean merlot, my Capel Pisco Sour Pica and of course my Pipore mate! The party is slow until I bring out my tiara with flashing led, then it really gets going. The Israeli girl has a go at us for making too much noise - oh the irony! She apologises in the morning, it was someone else disturbing her, we of course were being very reasonable. We headed out to a disco, but it looks seedly so we head home. Then Carlos and I go back again! Next morning, it's time to say goodbye to Carlos and Mariko, which is sad after a few fun days of hanging out together. I use the internet for a bit, grabbing my bbc podcasts painfully slowly, then walk round coast to Hanga Roa Hotel to get tickets for the dance show tonight, then meet Garam and go for dinner at Pea Restaurant by the water. The food is quite good, though Garam's chicken is remarkably like a fish fillet. They also are missing lots of ingredients, including rice! In a restaurant! The tuna sashimi is damn good though. All is forgiven! The show, the Kari Kari cultural ballet is in a large room in the Hanga Roa hotel, the largest on the island. It's so hot, so very hot! I fan myself with a postcard and pity the dancers! It starts off painfully, like a school production, chaotic but with lots of energy. Slowly I warm to it though, and end up enjoying. I think the band was much better in the other show, but this one has many more dancers. After cooking for an hour, we head Te Moana pub for ice-cold mineral water! Next day up late, as it's raining! Tropical rain. It's Sunday and most people are heading to church, it's supposed to be an interesting experience, with a mixture of Rapa Nui and Catholicism. It rains all day, and we hang at Garam's hostel, and sort out our photos. Garam makes Korean shin noodles which are yummy and spicy, then later Café Ra'a for a nice sandwich. 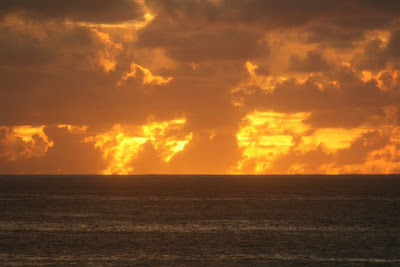 We head back to Tahai for another sunset, better than the first day as there are nice clouds being lit up. Good deal - litre of Becker beer for 3,000 pesos! 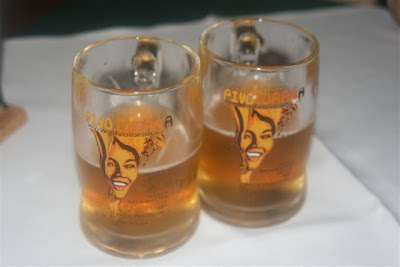 I am disappointed to learn that Easter Island used to have a Czech microbrewery which has now closed (we drink from their branded glasses). 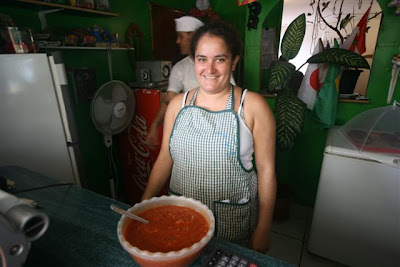 I buy some empanadas from Kite Mate for 1,500 pesos a pop, the cheapest food on the island, and very good too, then the dogs follow me all the way home! So many new friends with freshly-baked meat and tuna pie smell wafting out of my bag! Back to the hostel, Gonzales tells me that I've been moved out of my room to a dorm room, and my stuff has been moved. Rather rude without asking me - after all I left the hostel mid-afternoon and nothing was said at the time. Up, into town, bank, then out the other end, as our plan is to walk to the 7 Moai at Akivi, the last big touristy thing that we haven't done. Damn hot. The paths are not clear, and we wander all over, through guava farms - the guavas looks like limes, hanging on small bushes. Ripe ones are yellow, but even ripe they're full of hard seeds and not much fun to eat - best to leave them to be squeezed into juice. Garam spot the Moai. It's peaceful here. We sit in the shade of a tree, admiring the Moai until a tour group turns up, our excuse to run away. Back into town, and we get a lift from a Chilean chap who tells us that water on the island is not treated, which is food for thought when brushing teeth! Back to the hostel, then out for swim at Pea Beach. 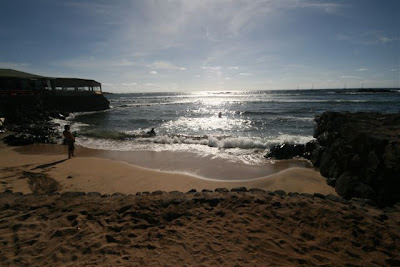 It's a nice spot, small and rocky, with lots of people surfing. Not very good for swimming though, as there are rocks all the way out underwater. Still refreshing to get back in the water after another stinking hot day. Café Ra'a for cappuccino, which they don't have, and a chocolate milkshake. Shower, washing, then dinner. It's our last, so we go to a French place on the seafront, the Taverne du Pecheur, but are rudely dismissed by the French waiter for not having a reservation. Instead we head to Te Moana, and have a really nice dinner sitting at the back. I had tuna with sesame and walnut and Garam has a steak, which she orders medium-well done, a big mistake as she gets a slab of charcoal on her plate! Up early for Garam's flight the next day. I don't need an alarm clock, as the cockerels in the area adequately provide this facility. The airport is small but pleasant, and security is a joke - Garam scans her bags through security, I just walk around with my laptop and camera bag. They issue her boarding pass, then tell us that Garam must go straight through security to gate, as the plane is now here and she can board. It's 9:30am and the flight is to leave at 11:45am. 2 1/4 hours later. Plus there's no plane. I know this because you can see out the window in front of us. However it's one of those bizarre conversations where you can't believe what they're saying. I check with three people and get the same story. You can board now. But there's no plane. Yes there is. No there isn't. Where is it then? I'm almost out of this continent thank god! In the evening an English chap called John and myself go to watch the Rapa Nui film. It's a Kevin Costner blockbluster, which everyone agrees is cheesy but worth watching. 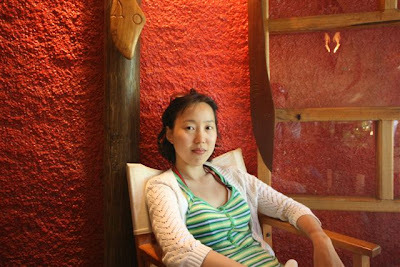 It is set in the days of the construction of the Moai, showing this, the tribes and how they behaved, and the bird-man competition, all strung together with a nice romance with the lovely Sandrine Holt. We enjoy it and our tuna empanadas with chilli sauce instead of popcorn We retire to Te Moana pub, and meet the owner, the pretty and curvatious (in all the right ways) Carolina. Several beers later, including Hinano from Tahiti for £5 a pop (I thought the waitress said £5 for the two), we head back to John's bike, joking about how it wouldn't beer there. It wasn't. Just then the police cruise by and say it may have been towed! Last day on Easter Island I potter. It's so hot. I get an Easter Island stamp on my passport for a dollar and enjoy a tuna empanada (plus a spare in the bag "for the road"). I have another go at updating blog for an outrageous price - it's torture here, I'm uploading 80kb pictures, and I have to try about four times with each shot as it times out until finally one works, then the next one, and so on. For all of these photos that you lot demand! I chat with the internet guys, and the thoroughly-good bloke Filippo gives me some mp3s of local island music, which I'm really happy about as I wanted some music but wasn't prepared to pay $24 dollars or something for it. I listen to the music on the way back to the hostel and it makes me happy!! NB: Credit for photos - the photos I have used in this report are both my own, and also Garam and Carlos' shots. 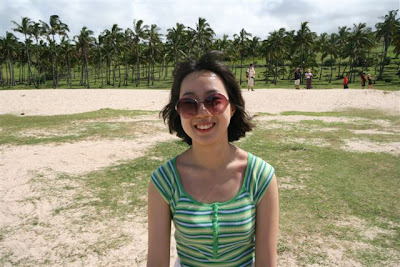 Plus Mariko took many of Garam's photos. Based on my times here, 7 days, I feel I'm in a position to give anyone coming here as a tourist a quickie "how it really is" guide to the island. 1. Two to three times as much money as you think you need. Pesos. Have dollars as backup, they operate the currencies in parallel here, even for a beer or internet it's no problem to pay with either, sometimes euros too. Travellers cheques work too, for example can be changed at the petrol station, but I have never used them so can't recommend. Small amount of petty theft on the island, otherwise safe. 2. Suncream. Lots of people getting toasted here by the intense sun, which you don't notice because there is always a sea-breeze. 3. A few comfort foods. The nosh here is not great by any standards. 4. Driving licence.. if you want to rent a car (not needed for bikes though). 5. Anti-mosquito stuff. 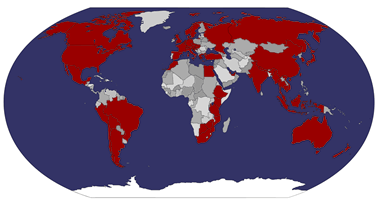 There are the "dengue" day-time mozzies here, and a dengue outbreak on the South American mainland. No actual disease here currently though, so don't panic if you're bitten! 6. The Rapa Nui film at Hotel Manavai's "cinema-bar". It's a bit cheesy and embarrassing, but the lead actress, Sandrine Holt, is rather delectable and runs about half-naked, plus you get to see some theories as to how the island was run, and the legend of the bird-man, who in this case Jason Scott Lee (oops spoiled the film!). 7. Matato'a Polynesian Dance and Music Show at Hotel Restaurant Ariki Nui, opposite Banco Estado. Better than the one at Hanga Roa Hotel, these guys have been on tour around the Pacific. To be honest, I'd pay just to see the music, even without the energetic dances. Tuna steak (ask for it lightly done) at Te Moana pub. 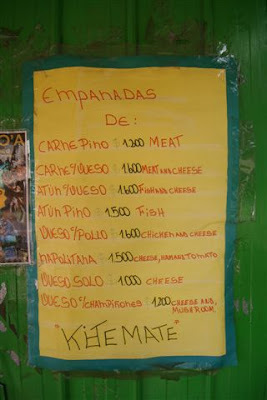 Empanadas at Kitemate - I recommend the tuna without cheese. Make sure you ask for chilli sauce. Beer (cheapest on the island) at the restaurant across the road from the Jardin de Pecheur. @Taim "cibercafe" internet for 1,500 pesos per hour, plus they're friendly blokes. Food for picnics at Kai Kene supermarket next to internet. Rent mopeds for the drive around the island. Go see sunrise at Tongariki or Akivi. Go see sunset at Tahai or up above Rona Kau somewhere. Diving - there isn't so much to see, but the visibility is amazing - 80m is typical. Banco Estado - evil scumbags. How are they allowed to carry on? They're giving the whole country of Chile a bad name for tourists. The price of Hinano beer from Tahiti. £5 for a can of watery lager! The state of the coastal road heading north out of Hanga Roa. Hard work on scooters. The police towing your moped away! Park carefully. There are no signs to help either. Use your intuition or black magic to work out where is okay. Bilzypap (for 'tis a silly name) canned drink. Like diluted Red Bull. Yucks. The locals having little idea when sunrise really is. They'll happily speculate though. Bunch of lazy sods!